During an Activision-Blizzard investor call, we learned that subscription numbers for World of Warcraft have dropped significantly from the peak numbers we saw during the launch of its current expansion, Warlords of Draenor. This sent a lot of players, some active, some long-since moved on, and some having never put serious time into the game, into a frenzy of debate over the cause of the steep decline. Mistakenly, many have attributed the exodus to the “age” of the game, citing it as the leading cause for waning attention spans. The reality is that WoW has no problem keeping everyone engaged when the content is there to draw them in. It’s true that the game originally came out in 2004, but it’s hardly accurate to call it a 10-year-old game with the implication that it hasn’t changed much over the years. As much as any numbered sequel, WoW has evolved significantly with each expansion. Yes, the core gameplay has not seen any dramatic changes, but is it any different when you compare the very first SimCity released over 25 years ago to SimCity today? Or Halo: Combat Evolved to Halo 4? The fundamentals have remained intact through the years. Each expansion presents a new iteration of the game with a plethora of changes and upgrades. If you compare, for example, the game’s player-vs-player mode in the early days to its current form, it’s a completely new landscape with a variety of arenas and battle types. Many of the systems have been streamlined or modernized, such as the Looking For Group tool that allows you to select the activity you want to participate in and automatically be grouped with other people also interested in doing that activity. In the past you had to use chat channels to find teammates which is draconian in today’s standards. Even the graphics, which are a consistent target in the ageism towards WoW, have come a long way over the years. As someone with a high-end PC, I can play just about any game with all settings maxed, in 1440p resolution, at a solid 60 FPS. With that qualifier, I believe I’m in a position to weigh WoW’s visual fidelity against the current crop of AAA releases, such as Call of Duty: Advanced Warfare or The Witcher 3. I can easily place WoW on the list of most graphically-impressive games on the market. No, the problem is not the game’s age. The problem is the quality of the content, specifically in the endgame, that has people cancelling their subscriptions. It’s not hard to see that there was less endgame content (the content that keeps people subscribed for long periods of time) out of the gate in Draenor compared to past expansions. The kicker is, not only is there less content but the expansion’s headlining feature, the garrison, is considered a bust by a significant portion of the player base. 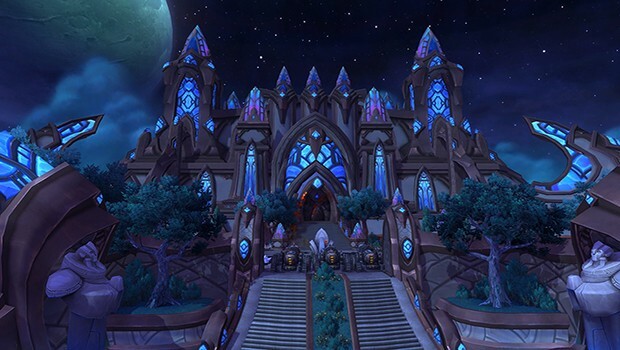 Ironically, garrisons were supposed to be Blizzard’s answer to repeated request for in-game housing. Instead it’s turned out to be a hindrance that has sequestered the community. The idea of player housing in an MMO goes way back, Ultima Online is a good example of the concept executed properly. In Ultima, banks that stored your items, such as equipment and crafting regents, had very limited space. At some point you needed to invest in a house to increase your storage space. Additionally, homes in Ultima were very customizable and could be decorated with items accumulated along your adventures. And the key thing about houses in Ultima is that they weren’t instanced. Other players could actually see your home and even raid it. In Warlords of Draenor, the player’s garrison is instanced and you can only enter your own. So you’re basically alone with a bunch of NPCs (computer-controlled characters) any time you’re at the garrison. This is a far cry from bustling capital cities like Orgrimmar, Stormwind, and Dalaran, which made the world feel alive. The garrison acts as a hub for many of the activities you used to have to set out into the world to accomplish. The problem is that this has reduced many activities to simply clicking through menus. Rather than flying to various zones to gather regents for your professions or complete daily quests, you can manage it all from your garrison by assigning “followers” to complete the tasks for you. This gives people less incentive to leave their “fortress of solitude,” as I’ve seen the garrison described, as well as burdens them with having to repeat the boring tasks on each of their characters. Another deflating factor is the state of PVP. To start with, it’s wrought with cheaters who use third-party programs to play for them. The cheating issue may begin to change thanks to the recent mass-banning of users Blizzard has determined are using bots, but for now it’s still shaky. Ashran, the expansion’s new end-game PVP zone, is widely considered a poor experience. I don’t PVP as much I used to back in the day, but it’s plainly obvious that Ashran is poorly designed and not very fun. Raiding is the one endgame activity that players still seem to adore. The fight mechanics are fun, the enemies and environments are cool, and the flexible raid system makes it easier for guilds of varying sizes to progress. Plus, the new mythic difficulty is a true challenge. Gone are the days when people used to complain that raiding in WoW was easy… if you want to put your guild to the test, you go mythic. Nonetheless, an additional difficulty tier is not the same as an additional raid dungeon, and raiders are ready to move on from the two current raid dungeons. Warlords of Draenor does a lot right, particularly with the 90-100 leveling experience. As I pointed out in my review, the new zones are gorgeous, the quests are fun, and the world bosses and treasures are fun to hunt down along the way. After hitting the level cap, though, you’re faced with a serious lack of engaging content, which explains the sharp drop in subscribers in such a short period of time. It’s true that the World of Warcraft development team has a tough job in keeping the game fresh and interesting year after year, but ultimately it’s not the age of the game that will alienate players but the lack of quality content. With the upcoming content patch 6.2, which is jam-packed with new things to do, and the cancellation of project Titan and the shifting of additional focus and manpower into World of Warcraft, I’m hopeful that the team can recover from its fumble and continue to provide one of the best online gaming experience for years to come.